This trick sells for $100 made up, however, using this PDF you can make it up yourself for a low cost and save some money. Invite 3 people on stage. No stooges or impromptu coaching. Can be any 3 people. One is given an envelope to hold before the trick even begins. This envelope is never touched again by the performer till the trick is over. Performer has three different newspapers face down on the table. The first spectator freely selects any newspaper. There is no force of any kind! He has a free choice of any one of the three newspapers. The front page of the freely chosen paper is now torn into 4 quarter sections. The spectator chooses a piece and is given the chance to change his mind. His selected quarter section is pinned to a 11 x 17 inch cork board. Magician now introduces a deck of cards and shows them to be a regular deck. He deals the cards face down and invites the 2nd spectator to say stop at any time. When the person finally says stop the face down card is given to them. The cards before and after are shown to be different cards. He is told if he went one further it would have been a different card. The selection process is very fair and appears above board. Single cards dealt and performer stopped at any time. Spectator Three is shown a clear bag containing colored markers. The markers are both broad and fine tipped. He is invited to reach into the bag and grab any crayon. This marker is given to the 2nd spectator who draws a picture of his card on the newspaper pinned to the board. The performer asks the person holding the envelope to open it and remove what is inside and hand it to performer. It is a folded sheet of newspaper. The envelope is torn open showing nothing else inside! When the paper is unfolded, it is seen to be the exact newspaper that was freely selected. Not only that the quarter section of the paper is identical to the one pinned to board. On the paper is a drawing of the card the person had the performer stop on. If that isn't enough, your prediction is in the same color as the chosen marker. A perfect 3 way match.....but there is still one kicker to come. 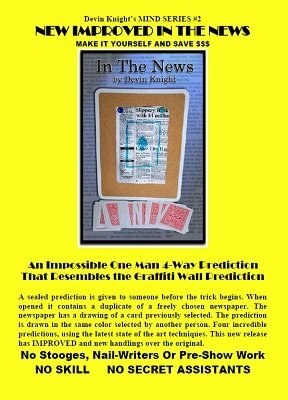 The audience notices that a small section of the newspaper prediction is still folded up. Performer looks at the person and says, "Is the marker you drew with a broad or a fine tip?" The spectator says, "Broad." For a final kicker the performer unfolds the bottom section and there written in BOLD letters is: BROAD TIP! No sleights of any kind. Prediction is in hands of audience before trick begins. No force of newspaper, they can choose any of the 3 papers. No rough and smooth or short cards used. They can stop you anywhere doing the deal. One man effect, no offstage or secret assistants needed. No secret writing during the show! No nail or boon writers. Prediction sheet can be left with the audience member. 1st edition 2013, 25 pages.